Cirque performers have pushed the human body nearly as far as the imagination can take it. Think Cirque du Soleil, where spectators are regularly dazzled by the awe-inspiring performances. The combination of acrobatics and incredible feats of strength have made this aesthetically pleasing form of art one of the most popular types of theater. On a professional level, these performers are as athletic as any performer in mainstream sports, as they posses tremendous strength, body control, and skill. Most of them began their training during early childhood, and they have to fine-tune their abilities on a daily basis. But this activity is not just for the pros, as many people have taken up this art as a way improve their health and fitness, and to push themselves to levels that most people will only dream of. Many professionals train at Cirque School LA, but a lot of the members of the studio are just normal folks who have simply fallen in love with this art form. “These are everyday people, but you can tell from what they are doing, that they must be obsessed to get this far,” Gavre said. Most active people would never think to attempt the maneuvers that cirque training involves, but for people who have tried it, it is not like any other type of training that they have done, and as much as building a great physique is appealing, the drive to master the movements keeps them coming back. It can take several weeks, or even months or longer, to perfect a certain maneuver, but when a person does the sense of accomplishment is the major payoff. The feat won’t go unnoticed, as the entire class will cheer a person on because they all know what type of struggle it took to pull off that trick. At Cirque School LA, their slogan is “for anybody with any body.” People of all shapes and sizes have taken on the challenge of this type of training, and for the people who have committed themselves to it, they have seen great results in terms of body composition. This is truly an activity for everybody, as Gavre points out that one class has a 24-year-old woman who’s an engineer from MIT, a 52-year-old man who’s a radiologist at UCLA, a 43-year-old woman who manages a construction company and a 51-year-old man who works in finance. The members in that particular class have been training for around three years, and they can pull off athletic movements that the typical person can only dream of. Fitness-wise, they’re all in great shape. Cirque’s training targets the upper body, as the chest, back, shoulders and abs get most of the work in a different fashion than the way those muscles would be trained in a typical gym. “The biggest difference between what cirque training is versus gym training is that you’re using your own body mass as resistance training. It’s all very functional,” Gavre said. Because the training is not about how much weight a person can lift, but how they can lift their own body weight, it puts everybody on an even playing level, which attracts a lot of people who may be intimidated by the heavy lifting that takes place in the weight room. Gavre has been involved in the cirque industry for over 20 years, so she isn’t shocked to see people pull off maneuvers that would seem impossible. She gets more of a rise out of seeing people achieve goals that mentally they thought they would never be able to do. One great benefit about cirque training compared to more conventional type of exercise programs is that when you get in great shape, you have also obtained a unique skill at the same time. 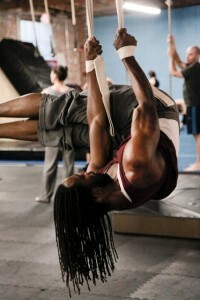 It is much more satisfying to master the awe-inspiring cirques movements than conquering a treadmill or dumbbell. Age is not a big deal, as some students start in early childhood, while the oldest student at Cirque School LA is 65. For the young and elderly, as well as the beginners, injury prevention is a key factor. “We don’t want anybody to leave here and not be able to go to their day job the next day, so we do a lot of protective conditioning for the body,” Gavre said. Many people incorporate cirque training into their normal workout routine or to help prepare them for other sports. Many people who have taken up this art form have become addicts, as they have pushed themselves beyond limits that they never thought that they could’ve reached. The physical and mental benefits make it more than worth the strenuous efforts that it takes to participate in this activity.